Our Abpromise guarantee covers the use of ab7526 in the following tested applications. This product has been prepared from Bovine Placenta and is chromatographically and immunologically pure. It reacts with anti-Collagen Type I. Reaction with anti-Collagen II, III, IV, V or VI is negligible (typically less than 1% cross reactivity was detected by ELISA). This product is not recommended for use under denaturing conditions in WB, IP, and ELISA. We would suggest testing it under native conditions. ELISA - Native Cow Collagen I protein (ab7526)Image courtesy of an anonymous Abreview. ab7526 used to generate a standard curve for ELISA, diluted to a concentration of 4, 2, 1 and 0.5 ug. Samples were from bovine LD muscle. ab34710 was used at a 1/1000 dilution as the primary antibody. ab7526 has not yet been referenced specifically in any publications. Publishing research using ab7526? Please let us know so that we can cite the reference in this datasheet. 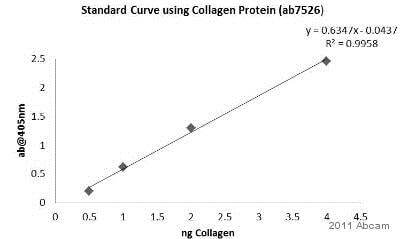 May I konw the accurate purity of the Collagen I protein (ab7526)? The collagen protein ab7526 is purified from the full length native bovine protein by a process involving limited pepsin digestion. The exact purity for this product is not determined. The bovine type I collagenab7526 is prepared by a proprietary method of limited pepsin digestion and selective salt precipitation and is supplied in a sodium acetate buffer containing sodium azide. However it is not tested to be free of telepeptides. Our customer has some questions to your Collagen I, AB7526. Can you tell more about the protein structure. Is it the intact protein? Are telopeptides still remain? Is the protein present in a triplehelix? Thank you for your enquiry. It is a native protein extracted by pepsin digestion. The basic structure should still remain. Hi, I am wondering if this anti-human Collagen type I antibody will work to detect collagen type I from whole cell lysates in regular SDS-PAGE (i.e. : in denaturing and dissociating conditions)? Thank you for your enquiry and your interest in our product. We recommend non-denaturing and non-dissociating conditions. Other conditions are not supported. Customer would like more details about how this was tested in ELISA, was it used in a sandwich ELISA? Thank you for your phone call. Ab7526 was tested in a sandwich ELISA. General Instructions for sandwich ELISA to quantify collagen in solution: 1. Coat the plate with unlabeled anti-collagen (type specific) at 10 mg/ml. 2. Use biotinylated anti-collagen (same specificity) at a concentration of 0.1 mg/ml. 3. Dissolve the collagen firstly in 0.5 M Sodium Acetate. 4. Dilute the collagen in 0.05 M Tris Cl, 1.0 M Sodium Chloride, pH. 7.4. 5. Perform serial dilutions of the collagen using the Tris/NaCl buffer. 6. Perform all steps at 4C using overnight incubations. 7. All buffers are to be at 4C. 8. Use Streptavidin-HRP for detection.